I remember my daydream years back before our little family had moved to Russia. I had spent a summer here previously, but I really had no idea what life would be like, and especially life as a family with a baby. Being the optimist that I am, despite the worries of leaving family and familiarity, my imaginary future life was bright and vivid. I can still see the crisp image in my mind of the home that I imagined I would have, and the life that I would soon lead. My quaint little imaginary home was bright and inviting with a little kitchen that opened up to our living room, perfect for frequent hospitality. The sun shone in the windows (really this was not as fanciful as it sounds since we were to move to southern Russia that is indeed quite sunny and bright), and I would sit there on the couch with my new Russian friends sipping tea out of little blue and white china tea cups, sharing deeply about our lives and talking about the gospel. I am not particularly prone to daydreaming, but for some reason this image remains vivid in my mind. What a shock it was to enter our new apartment for the first time, dead exhausted in every way, and to walk into our dark, dingy flat late on that first night. I had always considered myself relatively adaptable, as does anyone planning to leave family and culture for the international mission field, but as my eyes beheld these first images of my new home, the tears defied my will to hold them back. The furniture and decor was all very dark, the ceilings were low, electrical sockets practically hung out of the wall, and the dirt was abundant. The windows of my tiny kitchen were on the dark side of the building, crossed with iron bars, and the dishes were chipped and mis-matching and not enough in number to create a set even for our little family of three, let alone containing a beautiful set of ornate blue and white tea cups. And not only did the reality of my home contrast so sharply with the new Russian home of my daydream, but the reality of my new ministry was also just as strikingly different. I could hardly say, “Hello, my name is Ashley,” let alone have a heart-to-heart in Russian. And my supposed “natural language ability” proved to be quite circumstantial. This ability existed in a past life where I studied language for over 20 hours a week, without kids, learning Chinese. Studying Russian a few hours a week with a baby did not pan out quite the same. Rarely did anyone come to sit on my couch for tea, let alone to hear the gospel, and I wondered how on earth I would ever be a thriving and fruitful missionary. I remember the feelings of sadness, disappointment, frustration, and even hopelessness as I began this life that seemed far less beautiful or fruitful than I had daydreamed. I wondered and prayed if God would ever fill my living room with friends for tea and opportunities to share about God's love with others, but honestly that now seemed even more of a fantasy than my original daydream about the bright, inviting home and blue and white china tea cups. I was thrilled to love and serve my family, as all-consuming as that task was especially when we first arrived, and to help enable my husband to have a fruitful ministry, but was there ever going to be an opportunity for me to really feel like I, too, was a part of our work here as I had desired? The memory of this daydream and the feelings that came so strongly after I first arrived in Russia are what made a gift that I received last night in my kitchen over tea with friends so incredibly special. 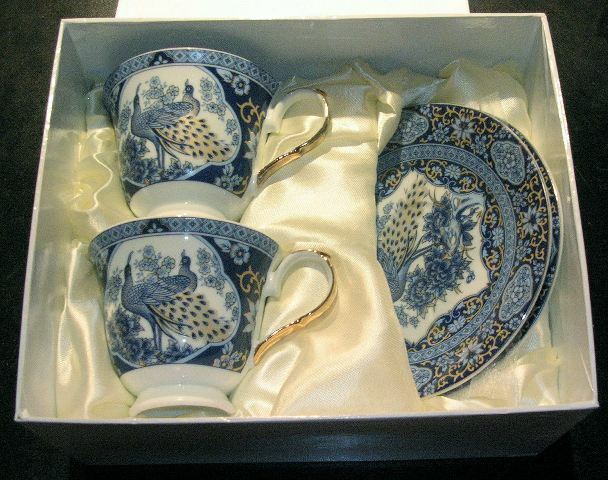 My dearest Russian friend, not yet a believer but with whom God has blessed me with true friendship, many heart-to-heart talks over tea, and conversations about the gospel, brought me a set of lovely blue and white china tea cups. She had no idea about the little daydream of my past, so to receive these little cups, just like I had imagined, from such a truly dear friend, is such a vivid and perfect picture to me of the Lord’s amazing grace in my life here in Russia. He has provided friends, he has provided a ministry that even I with all of my limitations can do, and He has even provided the blue and white china tea cups to remind me of His grace. God didn’t have to do it that way to remind me of His plan and power and perfection, but how incredibly grateful I am for this special display of His love. Do you remember your imaginary life on the field before you set foot in your new country? Does that image differ from the reality of the life that you stepped into? How has God shown you grace in this life that is perhaps not what you had expected, but all the same His perfect will? I love this post! I pictures my first year overseas very differently, too. I learned a lot about patience and knowing God always is there, working, and answering prayer--but sometimes not in the way we picture it. Thankfully we can't limit Him. Beautiful post. Thank you for your honesty and sharing how God's grace shown thru in a moment where you least expected it and in a way that you knew it had to be Him!